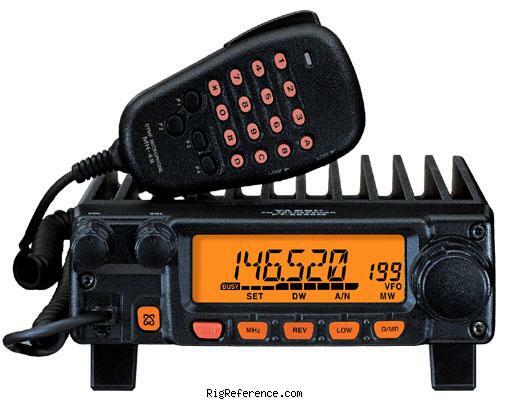 The Yaesu FT- 2800M is a Heavy-Duty 144 Mhz FM Transceiver. It provides high power output, a huge, easy-to-read display, and one-touch WIRES™ Internet Linking Access capability. Four selectable power output levels are provided: 65/25/10/5 Watts. The power selection may be stored into memory, allowing you to conserve power while using strong local repeaters. The FT-2800M’s receiver front end features Yaesu’s renowned Advanced Track Tuning RF input filtering, which affords outstanding protection from Intermodulation distortion. The FT-2800M provides a total of 221 memory channels, including 200 “regular” memories, ten pairs of band-limit memories, and an instant-recall “Home” channel you can dedicate to a frequently-used repeater or simplex frequency. Memories can store repeater shift information, CTCSS/DCS data, power output level, scanning status (“Skip”), and Alpha-Numeric labels. The FT-2800M includes a conveniently-located “Internet” key, for quick access to Internet-linked repeater systems. Internet repeater linking allows you to use your FT-2800M to talk to other Amateurs throughout the world, with outstanding voice signal quality. The “Internet” key may be configured to send either a single DTMF digit, or a DTMF string, for operation on a WIRES™ (Wide-Coverage Internet Repeater Enhancement System) repeater, or on other Internet-linked repeaters using DTMF tone access. For more information on WIRES™, please visit our Web site (www.yaesu.com), or send an e-mail to WIRES@vxstdusa.com. A special 10-channel Weather Band memory bank is provided in the U.S. version, allowing quick access to NOAA weather broadcasts. When the 1050-Hz “Severe Weather” alert tone is transmitted, the FT-2800M may be configured to emit an alarm tone to get your attention quickly. With the “Weather Alert” feature enabled, the FT-2800M will scan the ten Weather memories, stopping only if the 1050-Hz tone is received. The backlit MH-48A6J microphone allows direct keypad frequency entry, or keypad memory channel recall. On transmit, the MH-48A6J allows manual entry of DTMF tones for autopatch use, and the FT-2800M also includes a nine-memory, 16-digit DTMF Autodialer. Four user-programmable “soft” keys on the microphone may be programmed for easy control of a number of different features, and the [A]/[B]/[C]/[D] keys replicate the functions of the keys on the front panel of the transceiver, for maximum convenience while driving. The Yaesu FT-2800M has been replaced with the Yaesu FT-2900R. I purchased this at a ham fest. I paid about 100 dollars for it and that was a bit much. I was so wrong! I read online not to use full-power because it had issues burning up so I kept it on low and it worked perfect until I wanted to go dual band.. I miss it but I've moved onto HF all banders.. you will not be unhappy with it. Estimating the value of a rig can be challenging. We collect prices paid by real hams over the years to help you estimate the current value of the Yaesu FT-2800M. Just bought or sold this model? Let us know what you traded it for and help other ham operators!